THAT JACKET — Wink Ink Design Co. 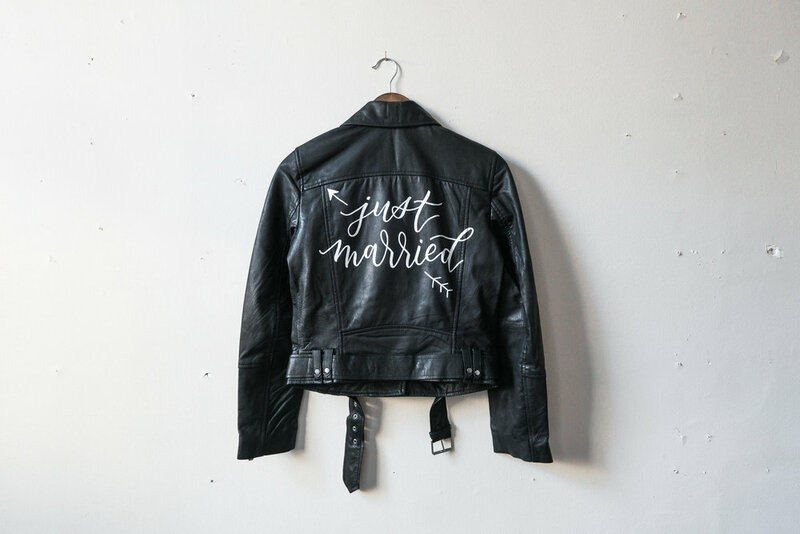 The Just Married Jacket sisterhood was brought to life by a Toronto based calligrapher, Sylvia of @ViaCalligraphy. For her wedding day, she wanted to add a little edge to her look by painting the back of her favourite leather jacket. After her intimate 8-person wedding, she decided to share the love with more local brides, and began trading it out for only a bottle of wine! Word travelled fast, and so far the original, #thejustmarriedjacket has been borrowed by over 75 Toronto brides! Sylvia has been expanding her project across the globe, and I'm so excited to share that Edmonton brides can now join this amazing sisterhood by renting #thejustmarriedjacketyeg! 1. BOOK: Check if the jacket is free for your wedding weekend. If so, fill out the form below! 2. TRADE: Borrow the jacket from Wednesday to Tuesday in exchange for a nice bottle of wine. 3. Bring the jacket back so that more brides can share in the fun, and our girl gang can grow! It is a medium, genuine leather jacket. You can rent it from the Wednesday through Tuesday of your wedding weekend. Will you ship it outside of Edmonton? Sorry, it is only available for local pick-up and return in central Edmonton. Sorry no, to keep with the original concept, it is just a single jacket. Please feel free to fill out a form and you will be added to the wait list, should anyone cancel. Of course! The only condition is that that I will not paint this same design, for originality sake. Yeah girl! Better snag it fast before someone else does! For any other rental pieces, please fill out a form with what you're looking for. Not in Edmonton? See if your city has been added to the sisterhood yet. Currently, there are chapters in: Toronto, New York, DC, London, Montréal, Vancouver, Baltimore, Ottawa and Oahu.